I know what you're thinking. Summer is barely over and I'm trying to get you to think about October? Well, my local grocery store is already putting out Halloween candy, and even more terrifyingly the solicitations for the November books are being released even as I type. So here's a dip through ten books that you might otherwise miss, all scheduled for an October release. From rock stars to trolls, it's all good. 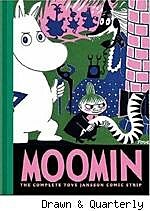 Drawn & Quarterly's best-selling collection of the Tove Jansson's Moomin comic strips, original published in the London Evening News in the 1950s, continues in this second volume. The Moomins - a family of Scandinavian trolls that resemble hairless hippos - attempt to hibernate, discover love and jealousy, meet new neighbors, and reinvent themselves in a "return to nature." Discover the comic strip that Neil Gaiman calls a "surrealist masterpiece" and Jeff Bone describes as "gentle, witty, and completely engrossing." A friend of mine is Moomin-crazy; he's been talking about the original novels by Tove Jansson for years and even has a Moomin tattoo. Needless to say, when someone is that in love with something I become a little skeptical. (It's why when I start waxing nostalgic about Doctor Who I'm not surprised to see friends slowly backing away.) That said, the first volume of the collection of the Moomin comic strip that ran in newspapers back in the 1950s was a real treat. It's very stream of consciousness, one random but funny event following another in rapid-fire succession. It's great because Jansson uses the serial format to her advantage, keeping everything moving at a brisk pace with repeated new cliffhangers. And come on, it stars trolls that look like hippos. Trust me, it's all good. Studio Foglio is proud to present the graphic adaptation of Robert Asprin's comedic novel Another Fine Myth. It chronicles the adventures of Skeeve, a hapless apprentice magician, and his demonic teacher, Aahz, who has been stripped of his powers. They battle with an insane wizard who is determined to drain the world of magic. Long out-of-print, this fantasy classic was the first professional comics work by Phil Foglio and Tim Sale. I don't know if you've ever read Robert Asprin's MythAdventures books, but either way you're in for a real treat here. Originally adapted into an eight-issue comic by Phil Foglio and Tim Sale, it was the perfect marriage of writer and artist. Asprin's dimension-hopping comedy-fantasy was laugh-out-loud funny in its original format, and Foglio's sharp sense of humor managed to make it even moreso. If you're a fan of Foglio's other comics, or merely appreciate a good laugh, you need this book. Buy it, buy it, buy it. Last year's inaugural Best American Comics book was a real joy to read, a wonderful survey of all sorts of comic books that were published in the previous year. The Best American series in general from Hougton-Mifflin has a high watermark of quality, and this is no exception. Consider it a comic book yearbook letting you know just what you might have missed out on and need to track down immediately. Chiaroscuro is the story of Steven Patch, an unemployed artist with a single blank canvas. Steven's busy living the introspective, angst-ridden life of your average twenty-something; drinking too much and complaining about his situation while doing little to improve it. A case of mistaken identity pushes Steven into a flow of events that bring him places he'd never imagined and forces him to make a choice between art and mere existence. 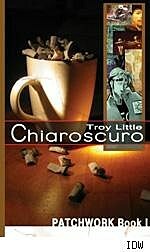 I remember when Chiaroscuro was self-published by Troy Little; it was a beautifully drawn book, one that owed a bit to Dave Sim's visual stylings on Cerebus, but that's not really a bad thing. It has a nice mixture of real-world drama with just a little bit of strangeness. Perhaps most importantly, though, it really felt like Little really did have something to say about being an artist (although it's not autobiographical). I'm delighted to see it coming back into print and in a completed format to boot. Hopefully this is just the start of more comics by Little as well; he's a talent that was just coming into his own when he vanished off the scene. Courtney and Uncle Aloysius continue their European vacation! But after the events of "The Fire Thief's Tale" can their relationship ever be the same again? It's old world monsters in new world style in the second of two one-shots featuring everybody's favorite pre-teen curmudgeon - Courtney Crumrin! If you haven't been reading Courtney Crumrin-and why not?-you're missing out on a world full of wit and intelligence. Courtney is a smart, sarcastic, and outcast-from-her-peers school girl whose family moved in with Great-Uncle Aloysius, only for Courtney to discover Aloysius's involvement in the mystical world. Ted Naifeh's stories are funny, slightly evil (that's a compliment), and absolutely clever. Where else do you get stories where the lead character casts a spell to make everyone like her, only to discover that being popular is annoying when you have nothing but disdain for your schoolmates? Check it out, check it out, check it out.